Email marketing is not same as Marketing Automation. Email marketing can be automated with a marketing automation tool. Let’s start from the beginning again. Email marketing is a simple tool used to create emails and send them to a static contact list. Campaign Monitor notes that every $1 investment in email marketing can give a return of $40 revenue. This means email marketing has a great ROI. Since every business has an email address, it is easier to stay connected via emails. You can communicate, collaborate, and build a professional relationship through email marketing. But it still is only a batch and blast tool. You end up sending the same email to your entire contact list. If your recipients find them relevant, great. If not, you lose them in a snap. Bottom line: Email marketing is a useful tool, but with some automation, it could be the most powerful one. So, I just add an automation feature to my email marketing tool? Umm… Actually, it is not ‘an’ automation feature. Marketing automation is huge and email is an integral part of it. Again, let’s begin with basics. Marketing Automation is not a tool. It is a concept which refers to automating certain repetitive marketing tasks. A software or tool that offers the features to automate these tasks is called as a marketing automation tool. It helps in automating lead capturing, nurturing via email marketing, and increasing conversions. Its functionality is based on customer-behaviour, while email marketing is more about sending out emails. To sum it up, personalization is absent in email marketing if an automation tool is not being used. But isn’t Marketing Automation Tool more costly? Yes. Most definitely it is costlier than a simple email marketing tool. But wouldn’t it be great if you can offer right email content to right customers at the right time? Marketing automation offers personalized lead nurturing and multi-channel marketing, which is worth the extra cost. So far so good. So is email marketing automation not same as email marketing? When you add automation features like autoresponders, drip email sequences, and create different list segmentation, it is termed as email marketing automation. An email marketing tool lets you track email opens, lead engagement on website, bounce rates, and email campaign performance. It helps in list building. Okay. But isn’t that what marketing automation was supposedly doing? Then how is email marketing automation different from marketing automation? Let’s take a pause. Before you get confused and jumbled up, let’s get few things straight. Email marketing tool: Helps in sending bulk mass emails. Period. Email marketing automation: Helps in scheduling autoresponders, track lead engagement on a website, automate email series like launching a drip email campaign, build email lists, and is perfect for shorter sales cycle. Marketing Automation: It enables you to nurture leads based on their personal interests, establish a brand-customer relationship, create a brand image, automated email campaigns (Yes, email marketing automation is a part of marketing automation), capture and identify quality leads, and so much more. Having said that, let’s start with how marketing automation is different from email marketing. Disclaimer: Marketing automation is perfect for business to business automation requirements. An email marketing automation tool is about sending emails, working on email domain reputation, improving email delivery speed and identifying the best SMTP server that can lessen email delivery failures. It is more focused on inbox placement. Marketing automation tool helps in designing marketing campaigns around lead behaviour. You can channelize your marketing efforts via multiple marketing mediums like landing pages, emails, mobile notifications, push notifications, SMS campaigns, and social media engagement. You track your lead behaviour on all these channels and create a lead profile. Using this lead profile, you send only those marketing messages that are relevant. When you are using an email marketing tool, you can track website engagement of your visitors/prospects and measure email metrics like open rates, bounce rates, unsubscribe rate, and click-throughs. 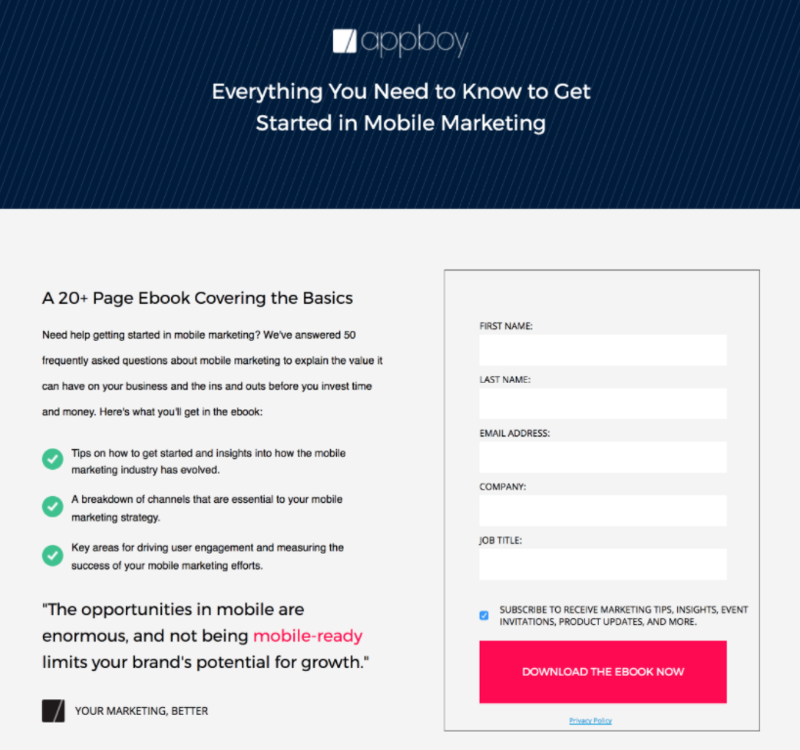 Overall you get an overview of how your email campaign has fared, and where you can improve. You can use your email marketing automation tool to schedule drip emails like onboarding series, welcome emails, or schedule autoresponders for certain marketing messages. However, none of these will help you know your leads closely. Mapping your leads or customers using an email marketing automation tool is not possible. However, you should know if you need lead nurturing or not. 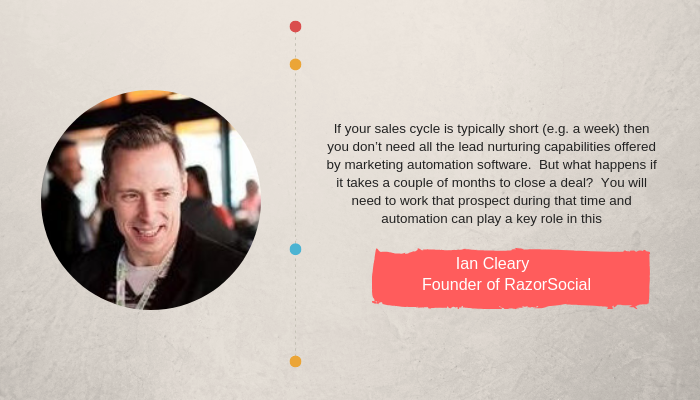 Highlighting the difference between email marketing and marketing automation, Ian Cleary, founder of RazorSocial, a content marketing, and digital marketing platform, says When you start building your list, you need to start off with an email marketing tool. If your sales cycle is typically short (e.g. a week) then you don’t need all the lead nurturing capabilities offered by marketing automation software. But what happens if it takes a couple of months to close a deal? You will need to work that prospect during that time and automation can play a key role in this. (Source)He says that a marketing automation is great for lead profiling only when you have a sizable list. While he also agrees that there is no specific number or measurement formula to determine this “size”, it is often more applicable when you have a steady inflow of leads. Marketing automation tool, on the contrary, first creates an impression of your new visitor or lead. It creates a lead profile that comprises of a wide range of details like location, the device used, browsing pattern, previous browsing history, social media presence, and every other information required for your business. Every marketing action revolves around your lead’s profile. A buyer’s persona is automatically created, which is a semi-fictional representation of your actual lead. This buyer’s persona helps in delivering relevant and personalized content throughout the lifecycle of this lead. Email marketing tool helps in list building. Since an email marketing tool mostly doesn’t have lead behaviour tracking feature, when a new lead comes, it is added to a common list. First, contact gets added to a list, then based on their email engagement, segments are created. Email marketing tools are a great way to start building lists for your email campaigns. There is no list building in a marketing automation tool. Here segmentation is dynamic. It happens automatically based on contact profile, contact actions, geo-locations, website behaviour, lead behaviour, and so many other factors. Marketing automation tool offers multi-channel marketing approach, which means you will have leads coming in from various sources. Imagine if you had to segregate each lead based on their source, behaviour, and demographics? Sounds daunting. But thanks to marketing automation tool, you need not worry about segmenting your leads. This happens automatically within your automation tool. Let’s say lead X visited your Facebook page and from there got redirected to your website, and lead Y wanted to download an eBook that you had published and filled up a short form for the same. These two have come from different sources. Hence, they will be segmented in two different lists automatically. The same lead can fill up a form to download my eBook and also visit my Facebook page. So, will they be segmented as two different leads? No. Marketing automation has complex algorithms and artificial intelligence working in the background. If the same lead visits your website but from two different sources, your automation tool can automatically club the information and list it as a single lead. Their action listing will have both the information exactly in the order performed – first, eBook was downloaded, then visited the Facebook page, and then to the main website; or the reverse – whichever happened first. A marketing automation tracks lead behaviour. Period. This is its core function, and also the sole reason for unprecedented popularity among B2B companies. When you know what your customers are looking for, you can design your product or services accordingly. You don’t make a product/service you think is great, but something that your ideal prospects need. Businesses benefit with survey forms, landing pages, lead profiling, and lead behaviour tracking. All these information help them design relevant marketing messages and also validate the potential of their product or services. Based on every lead actions, you can create different triggers. These triggers help in designed drip marketing campaigns. And when I say marketing campaigns, it is not just email campaigns. Automation tool lets you design personalized SMS campaigns, social media updates, and push drip campaigns. Also, you can use dynamic content to show marketing messages based on each lead behaviour. Email marketing automation tool does not support lead behaviour tracking. Like I said multiple times already, marketing automation lets you nurture leads through multiple marketing mediums. This evidently means that a marketing automation tool will have various assets to manage. For instance, landing pages, high converting forms, email templates, dynamic content, push templates, and more. For instance, below are the assets available in Aritic PinPoint. Asset management is absent is an email marketing automation tool, simply because these functionalities are absent in an email marketing automation tool. A B2B company will need landing pages and survey forms to understand what their potential business clients are looking for. It is not a one-day deal where a customer buys a product and deal is closed. It is more like a loop that goes on endlessly till the customer opts out by choice. On the contrary, the sales cycle for a B2C company is comparatively shorter. The sales goals are shorter and immediate. They are not looking for a long series of nurturing. For instance an eCommerce company. The end goal is to get an item sold. The entire sales cycle for an eCommerce company will be something like this: A new lead is captured —> Welcome email is sent —> Lead is added to email list —> Send automated drips like offers, new launches, discounts, sales, etc. —> Keep nurturing with such offers and details, at times exclusive offers with promo codes or contests —> lead browses few categories and adds items to cart —> leaves without purchase or makes the purchase. If that lead makes a purchase, its a success. If the lead leaves without making the purchase after adding items to the cart, ‘cart abandonment emails’ are sent to urge them to make the purchase. Once the purchase is done, a new sales cycle starts. The brand keeps promoting and informing about newer products, other categories of products, etc. to initiate another purchase. While ensuring brand loyalty is a big thing (something that eCommerce giant Amazon does very well), consumers can juggle between two or more eCommerce platforms at one time to ensure they get the best deal. But for a B2B company, it is more like a continuous loop. When a B2B company gets a new lead and that lead becomes a paid user for their services or product, at a certain time this service will expire. Then they will need to renew, which in most cases they would if they have a good experience. This loop continues until the customer wishes to opt out. Getting a lead to become a paid user is a long process. A lot of nurturing comes into play- free demo, consultation, trial period, making them understand the benefits, and more. For that businesses require survey forms, landing pages, social media presence, email marketing, mobile marketing, eBook creation, and so many other forms of marketing. It is comparatively longer than a B2C sales cycle. 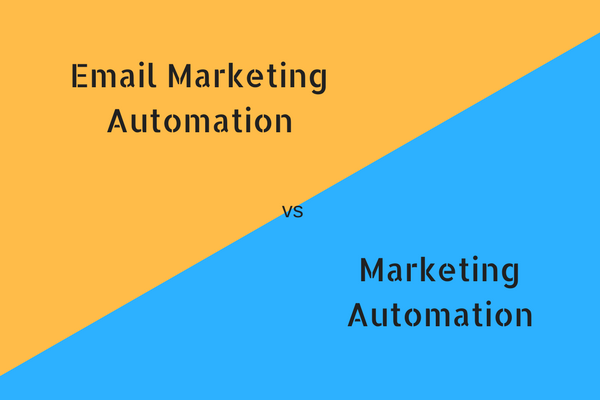 This difference in need between the two types of businesses has made way for these two forms of automation – email marketing automation and marketing automation. But that’s not all that a marketing automation tool offers. Marketing automation tool comes handy with a lot more features than mentioned above. Starting with planning, executing and seeing results – an automation tool has everything sorted out. Here’s are few more reasons why marketing automation tool weighs heavily over an email marketing tool. Lead scoring helps in identifying the most potential leads that are genuinely interested in buying your product or services. When a new lead signs up or subscribes, a marketing automation tool like Aritic PinPoint will automatically start tracking that lead. The entire lead behaviour and engagement will be tracked and based on each lead action, a certain point will be assigned. For instance, when a new lead subscribes, one point is assigned. When it directly visits the home page, one more point is added. If it visits a product page, one point more. For each product page, let’s assume you assign one point. For pricing page, the point increases to three. This way, based on every activity, a score is assigned. This obviously means, more active the lead is, more lead scores it has. And we know the most active leads are your most potential and genuinely interested prospects. I have already mentioned how dynamic segmentation happens in a marketing automation tool. Segmentation also happens based on this lead score. Hence, you know which are your hottest leads from their total score. Now, you design specific marketing messages and activities only for these leads. In marketing terminology, we call it Account-based marketing. 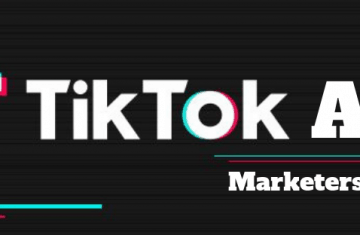 In this type of marketing, you concentrate your entire focus on specific leads and design marketing strategy based on the lead profile and behaviour. This type of marketing is said to increase conversion rates for most businesses. To know details about what Account-based marketing is, read What Account-Based Marketing really means. Progressive profiling is a more advanced way of capturing lead information. Your marketing automation tool helps in buying a lead profile. Using this information, you ask your leads questions that are aligned to their interests and browsing patterns. This catalyses form filling, and in most cases, leads tend to fill up all the questions. The simplest reason is, progressive profiling uses an accurate lead information to mould questions that they would want to answer. In return, you get lead information that helps in designing the best way in which you can nurture those leads and convert them in the long run. I have already mentioned about multi-channel marketing and drip marketing. A marketing automation tool also enables you to launch cross-channel drip marketing. For instance, when you are using Aritic PinPoint, you can launch email drips, schedule push drips, target social media ads, and also schedule SMS drip campaign simultaneously. All you need to do is set your behavioural triggers. Based on lead behaviour, your automation tool will trigger email drips or push notifications or SMS. It is also termed as omnichannel drip marketing. In short, a marketing automation tool lets you stay connected with your prospects round-the-clock. Check out 9 drip campaigns that can trigger more lead engagement. This is a great way to capture lead information because ideally the form is timed after a particular length of time that determines that the lead is interested in viewing the content. In order to continue viewing, the leads will divulge few basic information. Aritic PinPoint lets you design gated video content that you can add on your landing page or insert in your blogs. A marketing automation tool doesn’t really look like a productivity tool but it actually is. For a business to have more conversions of high-quality leads, it is mandatory that sales and marketing function together. They both need to target one single goal and work together to achieve it. An automation tool bridges the otherwise wide gap between marketing and sales operations. Marketing team requires information on how exactly an ideal prospect should be. This information is provided by the sales team. reversely, a sales rep needs all the information about a potential lead before he/she talks to them. To align both these teams and also improve marketing team productivity, an automation tool is a perfect solution. 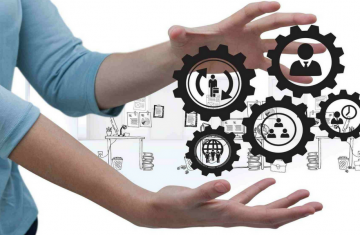 However, before implementing an automation tool, learn the best practices for marketing-sales alignment; because if the two teams are not getting along well, no software or application can save your business. Do you agree to these differences? Do you think you have more to add to this post? Tell me in the comments below and I will keep updating this post. Also, let me know if you disagree to any of my arguments. Thanks a lot for the detailed discussion about marketing automation and email marketing automation. Nice work Madhu, since I am a newbie into the field of marketing, so I found it as a useful blog. Great post! Madhu! I face a lot of difficulties in carrying out all our everyday marketing practices, and marketing automation is essential to tackle the challenges. Well written Madhu, an email marketing solution can only be useful if the leads are nurtured well so that they can be easily converted into customers. This can be easily done by marketing automation. Hey, excellent article Madhu! This blog gives the reader a detailed discussion of the differences between Marketing Automation and Email Marketing Automation. The post proved beneficial for us as it helped us with understanding the differences between email marketing and marketing automation. My team has benefitted a lot with this clear explanation. Hey Madhu, I recently got into digital marketing and there are quite a few concepts I am completely foreign too. These blogs really help me cope with my lectures. You have differentiated the two very well and cleared any doubts I had in the first place. Keep up with the work. This blog provides outstanding details of the differences between Marketing Automation and Email Marketing Automation. Looking forward to more such blogs from your side. An email marketing solution might be exactly right if our sales cycle is simple and leads don’t need a lot of attention, in such case a newsletter or a few promotional blasts can be used, while marketing automation is worth the investment when we are ready to start nurturing, scoring, and qualifying leads based on their engagement with our brand. Many businesses think that “marketing automation” is just vendor speaking for “email marketing”. The fact is that both are different and are definitely not interchangeable, which you have explained very well, Madhu. You nailed it Madhu! This post is so clear and easy to understand. Email marketing alone just doesn’t do it! We, marketers, face a lot of difficulties in carrying out all our everyday marketing practices and marketing automation is essential to tackle the challenges we face. The differences that you have mentioned clearly bring out the importance of marketing automation!